The Performance 600i is one of the newer treadmill models released by ProForm at the beginning of 2016. 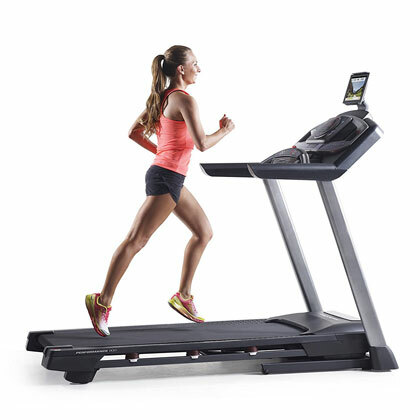 Although it’s not a commercial grade treadmill, it does offer an extensive array of features and functions, including motorized incline, and Bluetooth / iFit connectivity. It’s actually similar to the ProForm 995i, but this model has a slightly smaller motor and weight capacity. Before we proceed with the presentation of each one of the features of this treadmill, there’s one aspect to be mentioned though. Since ProForm has released several other “600” fitness machines, to avoid any confusion, you should know that this is the ProForm PFTL79515. Although it’s not a treadmill designed for commercial use, the ProForm Performance 600i still features an extremely sturdy construction. 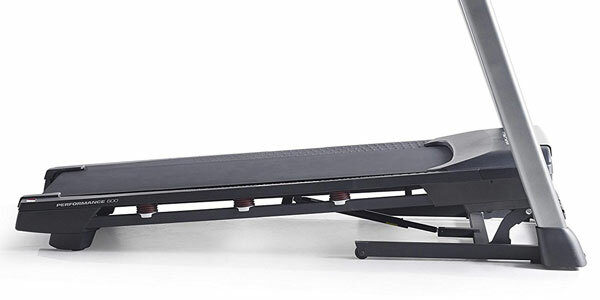 Its deck can actually support users up to 325 lbs (147 kg), which is fairly decent for a treadmill in this price range. It’s also a rather heavy unit, weighing close to 200 lbs, which means it’s an extremely stable fitness machine. The frame features a folding design. Its folding mechanism consists of a hydraulic piston, which assists you with the unfolding of the deck. In other words it softens the lowering of the deck, preventing it from dropping hard on the floor and sustaining damage. In order to lift the deck, you have to be able to lift approx 45 lbs (20 kg). Also, the rear part of the front base frame features a set of small wheels, which facilitate the relocation of the treadmill, when its deck is folded up. When it comes to footprint, this ProForm treadmill takes quite a bit of floor space, when fully assembled and unfolded. It’s approx. 80″ long, and 37″ wide, thus it may not be exactly the right choice for a small apartment. The deck offers a running surface of 60″L x 20″W (152 x 51 cm), which is long enough to provide a comfortable fi for users up to 6’5″ (195 cm). It uses a heavy-duty, 2-ply belt, resistant to stretching, which should last for many years of use. It integrates 1.9″ balanced and precision machined rollers, with sealed ball bearings, designed to last for many years of use. It also has 3 ProShox cushioning cells (on each side), which absorb up to 25% of your workout impact, rendering a running workout considerably less hazardous for your leg joints and back. Many would classify this ProForm treadmill as an entry level mid range model. Considering that it doesn’t have the 45% or more incline such as the commercial models, it does fall into that category. However, it does have a motorized incline which goes up to 12%, in adjustment increments of 1%. Needless to say, this particular feature can considerably improve your workout spectrum, and the intensity that you can add to your running or jogging workouts. The deck’s step-up height is approx. 7″ (17 cm) at 0% incline, and will raise by a few inches when the incline is set at 12%. Differently put, in order to avoid any ceiling height issues, before ordering this machine make sure you add at least 14″-15″ to your own height and compare the result with the ceiling height of the room where the treadmill will be in use. The ProForm Performance 600i treadmill is equipped with a 2.75 CHP. This particular motor is designed for heavy use, with a superlative continuous duty power, able to last without heating or slowing down even through the toughest, long-run workouts. It has a dynamically spin-balanced assembly, built with top-quality components, a motor to last a lifetime. That’s exactly why the warranty for this particular part of this treadmill is supplied for a lifetime. The motion generated by the motor is smooth, balanced, with a powerful feel. It supplies a speed range between 0.5 MPH and 12 MPH. Of course, this may not be the speed range that a professional athlete needs, but still, even if you train on a professional level, this treadmill can supply a consistent variety of workouts. Speed is adjustable in increments of 0.1 and 0.5 MPH. The console features keys for gradual adjustment, with dual press functions. If you press one key once, the speed of the belt will increase or decrease by 0.1 MPH, while if you press and hold the key, speed will be adjusted by 0.5 MPH. This is actually quite a plus, as you can easily find the pace that fits perfectly to your workout. There are of course, keys for quick speed selection, from 1 to 10 MPH. The motor itself is fairly quiet, the level of noise emitted shouldn’t interfere with your TV, the music played through the console, or your personal sound system. Most of the sound that you will hear during your running, is the sound of your cadence. The first aspect to mention regarding the console supplied with the ProForm Performance 600i, is its Bluetooth and iFit readiness, being compatible with most iOS and Android devices. You can connect it via Bluetooth with your smart device or laptop, and use an iFit app of your choice for your workout. You don’t need an iFit module to connect the console to iFit. You will be needing an iFit membership though, which costs approx $10 per month. The iFit apps give you the possibility to track your progress online, use various custom workouts or even create your own workouts with your own custom goals. Also, via Bluetooth the console can read your pulse from a chest strap transmitter. It’s actually compatible with most Bluetooth heart rate monitors. A HR chest strap is not supplied with the machine though, but even without one, you can still monitor your pulse by using the stainless steel sensors integrated in the front handlebar of the treadmill. There are two other amenities incorporated within the treadmill’s dashboard. One of them is the sound system consisting in two 2-inch speakers, and an iPod, MP3 player or smart device port with your music. Also, there are two volume adjustment keys on the right side of the console. Another one is the 2-speed workout fan, great to have for prolonged workouts. And finally, a tablet holder is also supplied with the treadmill. This tablet holder is wide enough to accommodate even the largest tablets, and attaches to the top of the console. The console is equipped with a Watts LED display, which can indicate time, distance traveled, pulse, pace, calories and watts. Evidently, it also indicates the current speed and incline settings. Distance can be displayed in miles or km, while speed can be measured in MPH or km/h. The fitness computer pre-loaded workout programs are 22 in number, 11 for Tempo workouts, 11 for Interval workouts. 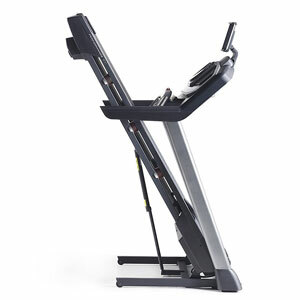 Needless to say, when using an one of these on-board workouts, the treadmill will autoadjust speed and incline. The machine’s console is fairly easy to use. Each class of workouts has its own key. There are quick keys for speed and incline adjustment, but you can also adjust speed and incline gradually, via the Up / Down and + / – keys. There’s also a “Stop” button which gives you the possibility to pause your workout if you need a break, or in case you alternate treadmill runs with other workouts. 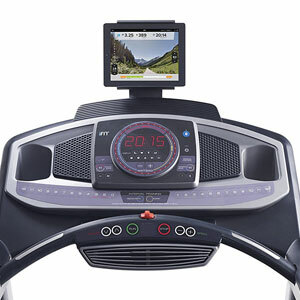 And finally, the console has the magnetic safety key feature, like most other treadmills. The assembly of this ProForm Performance treadmill is not complicated and shouldn’t take more than two hours. But due to the fact that the machine is heavy, transport and unboxing requires two people. The deck and motors are completely assembled and attached to the front part of the frame. All you need to add are the treadmill’s vertical posts and connect the console. The manual supplied offers pretty solid instructions for assemble, and all the tools required are supplied. In terms of maintenance, the manual specifies that the belt doesn’t need any lubrication, as it comes pre-lubricated with high-performance lubricants. But after a while, just as any treadmill belt it will require lubrication. Other than this, you also have to keep the running belt clean, free of any sand or fibers which may be caught in the motor and cause damage. HR chest strap not included. 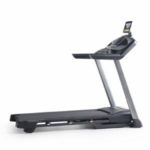 The ProForm Performance 600i is a mid range treadmill designed for home use. It features a sturdy deck, being able to support users up to 325 lbs. It’s equipped with a 2.75 CHP motor, and an automatic incline system. It offers 22 on-board workouts, being Bluetooth and iFit enabled. Differently put, it’s an excellent treadmill for running workouts, offering various cardio training, interval and weight loss possibilities. And finally, considering that it costs less than $800, it does offer a decent price / value ratio.